View of Coire Dubh from Meall Breac, with elements of the Northern Marginal Zone and the Eastern Layered Intrusion marked (see also Figure 4a). Geological map of Excursion 3: Eastern Layered Intrusion, Hallival and Askival. Extract from BGS 1:50,000 map of Rum © NERC) Full map and key. 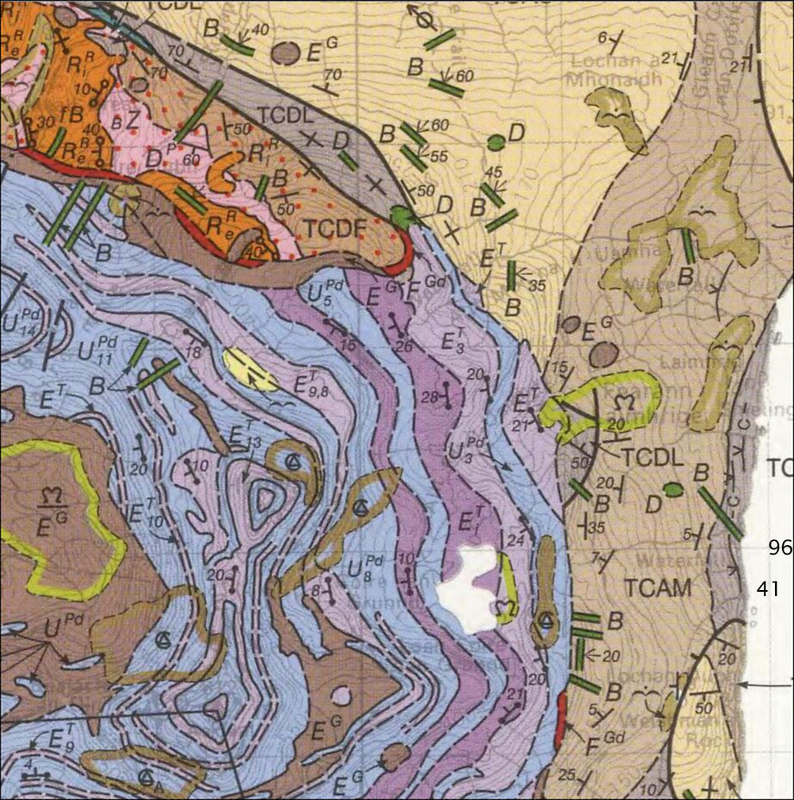 Chromite seams (along the contact between light anorthositic troctolite and peridotite) in an exposure (plan view) at the base of Unit 8, Eastern Layered Intrusion, Locality 3.2. Scale: hammer shaft c.30 cm. Undulatory ‘wavy contact’ between dark pyroxene-rich (gabbroic) and pale plagioclase-rich (troctolite) layers in Unit 9. Locality 3.3, shelf north of Hallival. Scale: hammer shaft c.30 cm. Slump structure in Unit 13 troctolite, Eastern Layered Intrusion, locality 3.6, Halival. Scale: hammer shaft c.30 cm. Rhythmically modally layered troctolite with small-scale, intra-layer slump structures. Note the small-scale slump structures in the upper part of the section, and the irregular upper surfaces of thin, in-weathering brown peridotite layers near the top and base, indicating corrosion by underlying peridotite. Section is about 2 m in height. South-east side of Hallival. View of west-dipping layered units in the upper part of the Eastern Layered Intrusion, south side of Hallival. Scale: about 120 m from grassy col to Hallival summit. Photo taken from Askival. Rockfall on east side of Hallival. 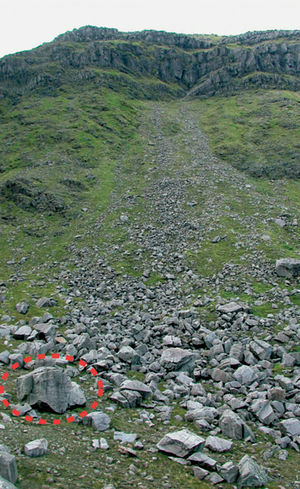 The large block at the base of the rockfall (circled) is about 5 m in height. Locality 3.8. 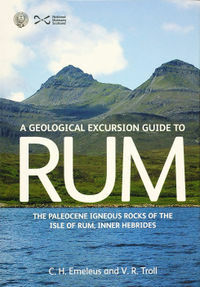 Excursion 3 from: Emeleus, C. H. and Troll, V. R. A geological excursion guide to Rum: the Paleocene igneous rocks of the Isle of Rum, Inner Hebrides. Edinburgh : Edinburgh Geological Society in association with NMS Enterprises Limited, 2008. 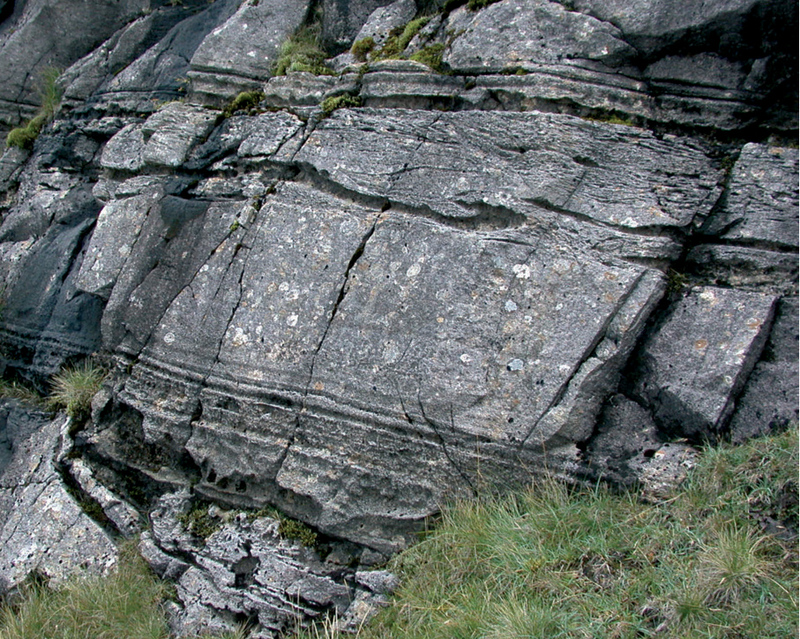 Highlights: Components of the Eastern Layered Intrusion will be examined during this excursion, which will focus on Units 8–15 in the upper part of the layered succession of troctolites (‘allivalites’), gabbroic rocks and feldspathic peridotites described in the classic paper by G. M. Brown (1956). Excellent examples of small-scale layered structures occur in the troctolites and adjoining chromite seams and an enigmatic ‘wavy horizon’ (pyroxene cumulate overlying troctolite) is seen. The full excursion is about 11 km in length and involves climbing to the summit of Hallival (722 m). It should not be undertaken in bad weather, but reserved for a fine day when the views from the summit of Hallival are spectacular. The excursion may be extended to include Askival (812 m), the highest peak on Rum, adding another 200 m of climbing and about 2 km distance. Taking the same route up to Coire Dubh as for Excursion 2, pass through the deer fence gate and follow the path on the west side of the burn for about 500 m (See image). Scattered exposures of intrusion breccia and baked Coire Dubh Breccia near the remains of a small dam indicate the proximity of the Marginal Gabbro. The grass-covered slopes to the west and south-east define the outcrop of the easily weathered gabbro, which dips north at a moderate angle (See image). Follow the path across a flat, marshy area and continue uphill for about 200 m in a south-south-east direction. Troctolite at the top of Unit 7 forms a prominent line of crags at about 370 m altitude. A thin skin of peridotite (the base of Unit 8) covers much of the back of the adjacent shelf. 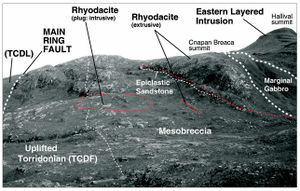 The junction between the units is complex: a thin layer containing anorthosite, chromite seams and peridotite overlies troctolite with small-scale layering and signs of slumping (Figure 27; Bedard et al., 1988) and small ‘outliers’ of peridotite, a few centimetres in diameter, are scattered across the shelf. The ‘outliers’ are separated from the anorthosite and troctolite by a thin chromite-rich layer that is generally a few millimetres thick, but which thickens locally to 1–2 cm in downward-projecting ‘sags’ or ‘potholes’ (cf. Lee, 1981). Continue gently uphill in a south-east direction, skirting round a prominent bluff [NM 3922 9728] at about 440 m elevation. On rounding the bluff a wide shelf in the Unit 9 troctolite extends for 400 m to the south-east, at 430–440 m altitude. There is small-scale layering in the troctolite which is also generally quite well laminated. The troctolite is overlain by a laminated gabbroic cumulate and there is a dense, laminated concentration of dark green clinopyroxene along the undulating contact (See image). Locally the wavy contact extends across the main mineral lamination. Weathering of the rock into several low scarps has provided beautiful exposures of this remarkable ‘wavy contact’ between troctolite and overlying gabbroic cumulates (See image). These must not be hammered. The relationships between the troctolite and gabbroic cumulates and the significance of the ‘wavy’ contact have been interpreted in various ways. Young and Donaldson (1985) suggested spontaneous formation at the interface between two fluids with reversed density gradients; Volker and Upton (1990) interpreted similar structures in Unit 14 on Trollaval to be flame structures caused by loading; whereas Bedard et al. (1988) were of the opinion that the overlying pyroxene-rich bytownite gabbro formed metasomatically from bytownite troctolite (allivalite) permeated by basaltic melt (see also Bedard and Sparks, 1991 and Upton and Volker, 1991). A complicating factor is a thick peridotite sill which underlies much of the shelf but transgresses through the troctolite at its southern end (c. [NM 3975 9685]), and has recently been invoked as a cause of metasomatic mobilisation of pyroxene, resulting in a frozen undulatory mobilisation front (see Holness et al., 2005; Holness, 2005, 2007; Holness et al., 2007a, b). The slopes to the south-west of Locality 3.3, backing the Unit 9 shelf, are formed of Unit 10 peridotite which is also well exposed in a near continuous section in the prominent bluff at the north end of the shelf [NM 392 971] (e.g. Brown, 1956; Tait, 1985; Palacz and Tait, 1985; Bedard et al., 1988). Ascend these slopes to reach the prominent shelf at about 530m altitude on the northern flank of Hallival. The shelf has good, if scattered, exposures of a well-developed, west-south-west-dipping, 1–3 mm-thick, chromite-rich seam between Unit 11 troctolite and Unit 12 peridotite. The ultrabasic rocks in this area are intruded by a steeply inclined gabbroic sheet, but it will be noted that minor intrusions are uncommon when compared with exposures examined on Excursion 2. Proceed south-east for c. 400 m to the base of the cliffs on the north side of Hallival. 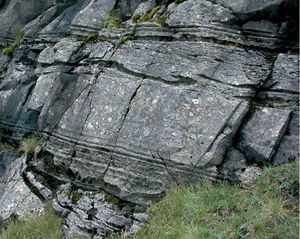 The small-scale layering in the thick troctolite of Unit 13 is commonly disturbed by slumping (See image). Thin disconnected layers of anorthositic troctolite have been tightly folded, and the rocks in general show signs of disruption and shearing. Thin layers and stringers of peridotite appear intrusive or, in some instances, to have partially replaced troctolite. Close to Locality 3.6 a fairly well-defined path leads to the summit of Hallival, passing up through Units 13 and 14, where further examples of disturbed troctolites and apparently intrusive peridotites occur. 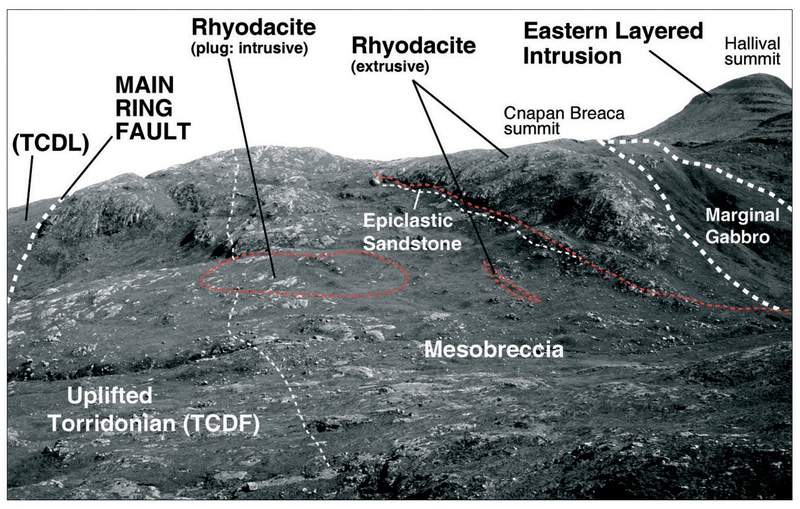 Around the Hallival summit area (See image), (See image), there are further examples of intrusive (and/or slumped?) peridotites in the troctolite (Renner and Palacz, 1987) and a thin, pale-grey dyke of intermediate composition cuts the layered rocks a short distance to the south. Hallival provides an excellent viewpoint on a clear day. Nearby, to the south, are the layered rocks of Askival; to the north, the west-dipping Torridonian strata on Mullach Mòr, with the Skye Cuillin and Red Hills in the background and the Applecross hills in the far distance. 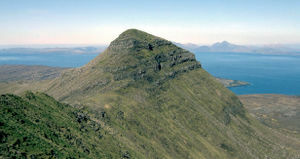 The Isle of Eigg with the spectacular pitchstone ridge of the Sgurr lies to the east (Hudson and Allwright, 2003), with the high mountains beyond Loch Nevis and Loch Morar in the background, amongst which the distinctive outline of Ben Nevis may be visible (over 80 km distant). To the west, the rough ground formed by peridotites and gabbros in Glen Harris, and on Barkeval and An Dornabac contrasts strongly with the smooth scree-, grass- and boulder-covered slopes of Ard Nev and other microgranite hills, while step-weathering lava flows are visible on Orval and Fionchra. Far to the west of Rum, beyond Harris Bay, the lighthouse on Oigh-sgeir may be visible. This is built on pitchstone similar to that which forms the Sgurr of Eigg. The lavas of Canna and south-west Skye lie to the north-west and, beyond them, the line of the Outer Isles may be visible. The views are a considerable reward for climbing Hallival, which should be visited on a fine day, even at the expense of disturbing an otherwise apparently logical sequence of excursions. From Hallival the return to Kinloch may be made by retracing the path down to the shoulder on the north-west side of the hill and continuing in a north-west to west-north-west direction until Bealach Bairc-mheall is reached. From the col [NM 3865 9707], at 466 m altitude, a rather indistinct path leads down to the flat area at the base of Coire Dubh (near Locality 3.1) and back to Kinloch by the same route as was taken earlier in the day. Alternatively, and preferably in dry, fine weather, take the well-defined but steep and rocky path south-south-west off Hallival down to the col [NM 3946 9592] at 600 m altitude, then descend eastwards into Coire nan Grunnd. However, if the Askival summit area is to be visited, the easiest route from the col is to contour in a southerly direction along the base of the cliffs on the eastern side of Askival for about 700 m from which point an ill-defined path climbs in a generally west-north-west direction through the troctolite crags to the summit. 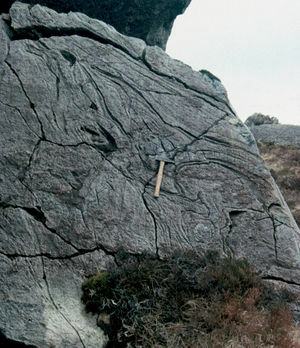 There are excellent examples of slumping in Unit 14 troctolite on this path (See image), (See image); Brown, 1956). 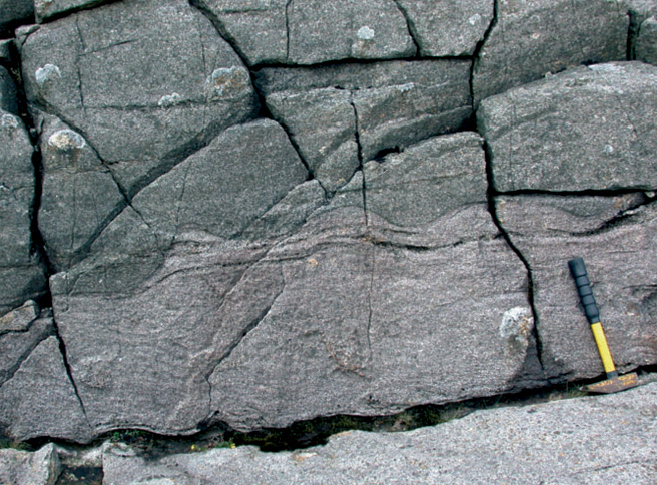 Major folding in troctolite, attributed to slumping, is also seen in cliffs north of the summit (Emeleus, 1997). The views from Askival equal those obtained from Hallival. The three-dimensional details of troctolite layering are beautifully displayed in house-sized blocks scattered across the floor of Coire nan Grunnd (See image). There are also excellent views of the layered rocks on the south-east face of Hallival (See image), where structures suggesting disruption of peridotite in (slumped?) 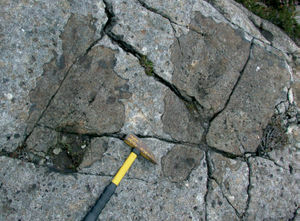 troctolite are visible. Binoculars are a distinct advantage here; the remains of recent spectacular rock falls on this side of the mountain bring one to realise just how unstable these slopes can be (See image). From Coire nan Grunnd continue north-north-east at about 350 m altitude, passing grey-weathering gabbro sheets intruded more or less conformably into the layered ultrabasic rocks. After about 1 km, pass over a low col [NM 402 968] and continue north into the broad, shallow valley in the headwaters of the Allt Mòr na h-Uamha (around [NM 402 970]). Inclusions of ultrabasic rocks and of fine-grained highly hornfelsed mafic rocks occur within gabbro exposed in slabs to the north of the stream. The altered basalt may represent rafts of basaltic lava (from the Eigg Lava Formation) which have subsided from the intrusion roof onto the contemporary floor. Pale-coloured spots rich in plagioclase and containing hydrogarnet are interpreted to be metamorphosed amygdales (Faithfull, 1985). Continue for about 400 m in a direction slightly east of north, passing east of the Cnapan Breaca ridge at about 350 m altitude, where easily weathered Marginal Gabbro bordering the ultrabasic rocks is exposed in contact with baked sedimentary rocks [NM 402 976]. At this point, a somewhat ill-defined path leads in a northerly direction to a gate in the deer fence. From the fence, continue north-east for about 350 m across rough, peaty ground to join the Dibidil–Kinloch path. Alternatively, from Locality 3.8, follow the north bank of the Allt Mòr na h-Uamha down over moderately steep rock-, grass- and heather-covered slopes to the Kinloch–Dibidil path where there is another deer fence gate [NM 4047 9743]. Walk north along the path to Kinloch (c. 2.5 km from the gate). This page was last modified on 22 December 2015, at 19:04.